Moscow, March 28 : NATO Secretary General Anders Fogh Rasmussen has said a unified missile shield under joint Russia-NATO command is not a workable approach. Rasmussen was asked to assess the potential of missile defence systems under joint Russia-NATO command during his address at an International Model Russia-NATO Council meeting in Moscow. Brussels, Dec. 21 : NATO Secretary General Anders Fogh Rasmussen has said that Pakistan and Afghanistan are facing the common challenge of terrorism, and the menace can not be effectively dealt with if the countries are seen separately. He pointed out that both Pakistan and Afghanistan are countering identical challenges so they could not be seen as different. The News quoted Rasmussen, as saying that NATO’s new strategy to uproot terrorism from the Af-Pak region is based on increased cooperation with Islamabad. Moscow, Dec 16 : NATO Secretary General Anders Fogh Rasmussen said Wednesday the Western military bloc is seeking greater Russian assistance for international operations in Afghanistan. Speaking to reporters after talks with President Dmitry Medvedev, Rasmussen said he was inviting Russia to step up its assistance in Afghanistan, including by supplying helicopters, spare parts and fuel, and by training pilots. This is the first official visit to Russia by the Danish NATO chief, who took office in August. London, Dec 4 :Seven thousand more troops from 25 countries are to join the 30,000-strong US surge in Afghanistan, Nato Secretary-General Anders Fogh Rasmussen said Friday. This will take the total number of foreign troops in Afghanistan to around 140,000, Rasmussen said without disclosing how many of the contributing countries were members of the Nato. Rasmussen said that a recent announcement by US President Barrack Obama giving July 2011 as the deadline for the US troops to start withdrawing did not signal a decision to quit Afghanistan. London - NATO Secretary General Anders Fogh Rasmussen said Thursday that more troops will "definitely" be needed in Afghanistan to train Afghan soldiers and the police but the level of reinforcements was still under consideration. Speaking in London after talks with British Prime Minister Gordon Brown, the NATO chief said he and Brown agreed that the "way forward" in Afghanistan was a "gradual handover of security responsibility" to Afghan forces in a process that could start as early as next year. Oslo - Helping Afghans claim their future was the main theme of a meeting between NATO Secretary General Anders Fogh Rasmussen and Norwegian Prime Minister Jens Stoltenberg in Oslo Friday. "The way forward is that the Afghan people and government take responsibility for security in Afghanistan," Rasmussen said. "Our mission in Afghanistan ends when Afghanistan is capable to take charge of its security. That is what we will help with." Paris - France's return to NATO's military command structure was a decision of historic importance, the transatlantic alliance's new Secretary General, Anders Fogh Rasmussen, said Thursday in Paris. "France's full return to NATO will improve transatlantic relations and strengthen NATO's international position," Rasmussen told journalists after holding talks with the French President Nicolas Sarkozy. The decision will also stimulate the development of a European security and defence policy, the NATO chief said. Brussels - NATO's new secretary general, Anders Fogh Rasmussen, and Russia's ambassador to NATO, Dmitri Rogozin, vowed to step up military cooperation in Afghanistan during their first meeting in Brussels on Tuesday. During what was described as a "positive" and "friendly" meeting, NATO officials said Rasmussen and Rogozin had agreed that the sides should also work together in the global fight against nuclear disarmament and against piracy. Kabul - NATO's new secretary general, Anders Fogh Rasmussen said Wednesday in Kabul that Afghanistan "will be my highest priority", vowing that alliance forces would do their utmost to provide "the best possible security" for the August 20 presidential election. Rasmussen, who was talking to journalists in joint press conference with President Hamid Karzai in Afghan fortified presidential palace, said: "I assure you, the Afghan people, that we will stay to support you for as long as it takes to finish our job." Brussels - NATO's new secretary general, Anders Fogh Rasmussen, visited Afghanistan on Wednesday on just his third working day in his new job, the alliance said. Rasmussen, formerly Denmark's prime minister, was set to meet Afghan President Hamid Karzai, the head of NATO's military mission in the country, General Stanley A McChrystal, and UN special envoy Kai Eide, NATO announced in a statement. He was also due to meet other candidates for the presidential election scheduled for August 20, and with some of NATO's 64,500 ground troops. Brussels - NATO's new secretary general, Anders Fogh Rasmussen, said Monday that he has already called for talks with diplomats from countries in North Africa and the Middle East, amidst lingering concerns over his relations with the Muslim world. Rasmussen was Denmark's prime minister in 2005 when a series of cartoons in a Copenhagen newspaper with caricatures of the prophet Mohammed outraged Muslim public opinion. Monday was his first day in his new position. Brussels - Anders Fogh Rasmussen, the former prime minister of Denmark, officially took the office of the secretary general of the North Atlantic Treaty Organization in Brussels on Saturday, replacing Jaap de Hoop Scheffer. Rasmussen is to take up the work of the military alliance on Monday and is to lead a meeting of NATO members on Tuesday. The new chief's greatest challenge will remain Afghanistan, where the NATO-led International Security Assistance Force (ISAF) has 64,500 soldiers and must secure the country for upcoming presidential elections. 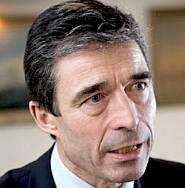 Ankara - Future NATO Secretary General Anders Fogh Rasmussen on Monday attempted to soothe Muslim antipathy to the role he played in 2005 as Danish prime minister when he failed to condemn cartoons of the Muslim prophet Mohammad published in a Danish newspaper. Speaking at the Alliance of Civilizations in Istanbul, a meeting that promotes dialogue between leaders of the West and the Islamic world, Rasmussen did not directly apologise for his actions in 2005. But he did say that he respected all religions. Copenhagen - Newly-designated NATO chief Anders Fogh Rasmussen formally handed in his resignation Sunday as prime minister to Danish Queen Margrethe II. Rasmussen, 56, is to be succeeded by his namesake, 44-year-old Finance Minister Lars Lokke Rasmussen, as head of the government. The formal resignation comes a day after the NATO summit in Strasbourg chose Rasmussen as alliance's next secretary general to succeed outgoing NATO chief Jaap de Hoop Scheffer. 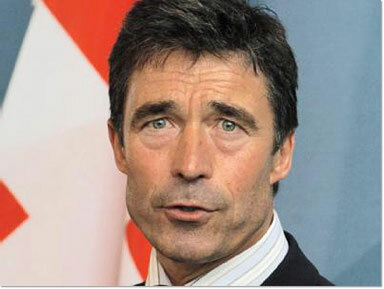 Rasmussen would take over his NATO post on August 1.